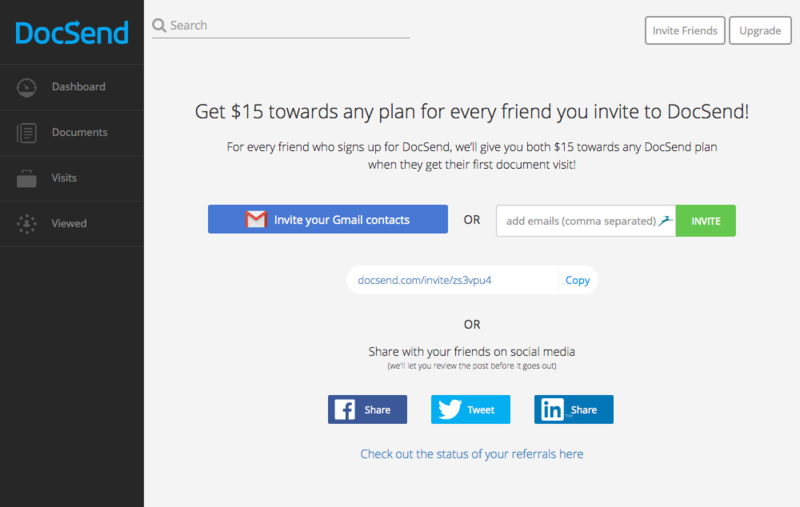 Earn DocSend credit by referring your friends. Today we’re making it easier than ever to share DocSend with your friends. And as a thank you we’ll be giving you and any new users you invite to DocSend a $15 credit towards any DocSend plan when they get their first document visit. That’s equal to one month of DocSend Personal, which gives you unlimited documents and visit stats. Credits will be stored in your account, and you can use them at any time. They won’t expire. To invite friends and earn credit simply send your friends your unique invite link. If you’d like to invite a whole bunch of folks at once you can import your Gmail contacts to select whom you’d like to share with, or you can post your link publicly on Facebook, Twitter, or LinkedIn. As we say “thanks” to you we’d also love to thank Ivan Kirigin for his wonderfully inspirational video on the subject of referral program best practices. Thanks, Ivan! As always feel free to reach out with any feedback: [email protected]. In the meantime happy referring! Now you can easily connect content to ROI, including deal size, deals won/lost, and revenue attainment, using custom fields in Salesforce.